A compilation of messages from FFJ’s radio program “Koji Kaneko’s Family Talk.” Third in a series. "Trying to raise children in the midst of unprecedented financial hardship leaves many suffering from anxiety verging on terror. I hope that this program will help both parents and children cope better as we wrestle with current issues." A unique devotional guide for the pregnant woman. The weeks of pregnancy until the baby’s arrival are the “Nine Months to a Miracle.” During those months a mother has the opportunity to grow in grace and strength at the hands of her Creator. Each chapter closes with note pages to write a lasting record of doctors’ advice, “Changes in my body,” and “My Thoughts.” An ideal gift for the expecting mother! This is a very useful, necessary book, ideal for an expecting mother’s personal devotions. I anticipate using this in the future to advise pregnant women and their husbands. 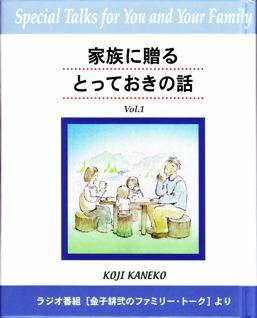 FFJ’s radio announcer Koji Kaneko has compiled a series of short talks based on his program “Kaneko Koji’s Family Talk.” Drawing on current events in Japan, Kaneko uses the common experiences of raising his own children to offer timely advice and encouragement for the whole family. - Japanese only. My daily radio program has become a set of books. The content is not a lot of success stories, rather, I wrote hoping to provide hints and food for thought for those who love their children, and hope to enrich their family life. The articles are based on my own background and experiences, as well as episodes I’ve received from a variety of people, to make the material as practical as possible. The best of Dr. Dobson's concise advice on marriage and parenting aired on his worldwide radio program "90 Second Commentaries" is available in printed form in these four volumes. Each volume contains over 50 commentaries divided into four main topics: The Married Couple, Raising young Children, Raising Teens, and General family Issues. Recommended reading for Christians as well as non-Christians. The best of Dr. Dobson's concise advice on marriage and parenting aired on his worldwide radio program "90 Second Commentarie" is available in printed form in these four volumes.